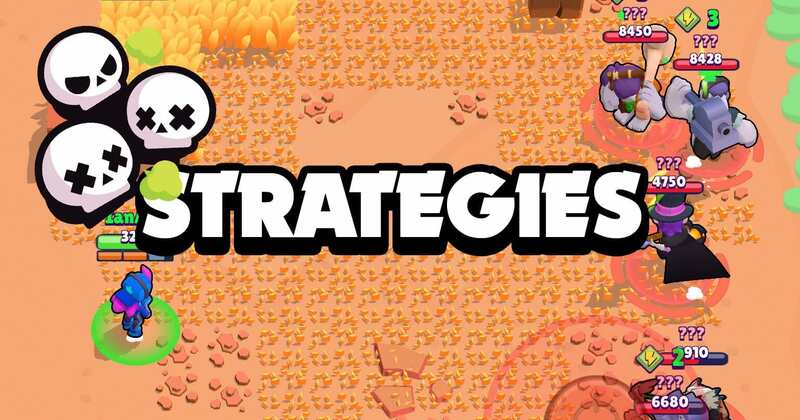 The Best 6 Strategies for Showdown Mode | Brawl Stars UP! Hey Brawlers! 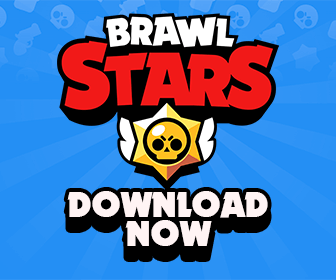 Today, let’s find out the best strategies for the Showdown mode, best Brawlers for each strategy, when to use them and how to counter them! Top 6 Strategies in Showdown Game Mode! Survival strategists will do anything to stay away from the enemies Brawlers. Their goal is to avoid any type of conflict at all costs by hiding in bushes, running away from enemy brawlers rather than chasing them and then moving away from parts of the map that have a high concentration of players on it. This strategy can work well for any brawler in the game if you become a master of it and it’s not actually too hard to master. Though sometimes it can be kind of boring. The best ones for the survival strategy are going to be brawlers that take a little bit of time for them to actually take out boxes on their own, may struggle out in the open against other brawlers or may have a difficult time actually taking out enemy brawlers by themselves. Nita, Jesse, Bo, Barley, Poco, Penny, Piper and Tara. 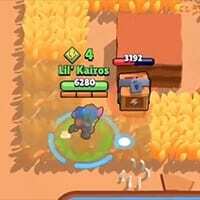 Even if you do get a good spawn location though, the survival strategy can be an excellent choice if you are willing to sacrifice that chance for that number one position for consistency in trophy pushing the best way to counter a survival strategist is to always check the bushes and try to post them around the map a little bit by pushing them around. Eventually if they keep on falling away from you then they will get caught between you and another enemy brawler, which will definitely cause certain doom for them. Ahnold strategists try to win by going for as many power cubes as they possibly can so that they can just straight up out-power their opponents. They do this by going wherever there’re the most boxes on the map, usually the center, and by risking their own survival for a chance to take out anyone else or their power-ups. 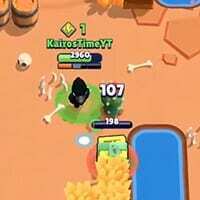 In my opinion this is the most fun way to play showdown but I can also lead to the biggest trophy losses. The best brawlers to use the strategy are ones can take out boxes quickly as well as deal with enemy Brawlers. Now this can depend a little bit on your brawler levels. At max level, the best Ahnold strategy brawlers are Shelley, Colt, Bull, Brock, Dynamike, El Primo, Ricochet, Darryl, Pam, Frank, Spike and Leon. Typically, the best time for you to use the Ahnold strategy is if you spawn close to a lot of boxes or if there are a lot of boxes on the map. Taking into consideration what brawler you’re playing is also very important when it comes to this strategy. 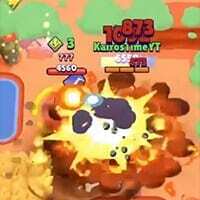 If you don’t have a way of dealing with close up brawlers that are all firing and targeting you in the center of the map then it might not be the best strategy for you to use. How to counter this strategy? The best way to counter an Arnold strategist is obviously to take them out before they get too many power-ups or if they happen to get caught up in between you and some other brawlers to make sure you always focus your fire on them because they’ll be your biggest opposition when it comes to actually getting that number one spot as opposed to the other brawlers they’re helping you take him out. Now vultures either hide in the bushes themselves or they roam around the map looking for opportunities for them to steal other people’s power cubes or other people’s kills. They may do this from a distance as they keep players pushed back with a controlling attack or they may just swoop in at the very last moment to pick up a cow power cube and then run away. The best brawlers to vulture with are brawlers that offer a lot of control that allows them to keep people pushed back from a distance or brawlers that have some sort of ability that allows them to swoop in grab stuff and swoop back out. 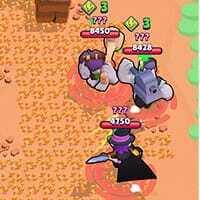 The best Brawlers use the vulture strategy are Dynamike, Bo, Barley, Darryl, Pam, Mortis, Tara, Crow and Spike. The best time to be a vulture is if you know that you can push the enemy brawler back without dying yourself and typically this requires a good bit of patience and a good understanding of the 1v1 interactions with every Brawler in the game. The best way to counter a vulture is to make sure that you have enough ammo to deal with them rather than spamming your shots on a box or spamming your shots to try and take out a brawler. You should just fire off one ammo slot at a box at a time or brawler at a time and then make sure you have those two others in reserve so that you can push the vulture back and prevent them from stealing your kill or power cubes now. True teamers will try to win by spinning when they find an enemy brawler and if the enemy brawler spins back, true teamers will form a temporary truce to try and take out everyone else before turning their backs on each other. True teamers will never attack each other and do their best to take out anyone else before they actually turn on each other. They’ll also share power-ups with each other. An advanced strategy for true teamers is to actually charge up your Supers on each other so that you can then go and dominate everybody else. The best time to team is when you see an enemy teamer that is spinning and that also is playing a brawler that listed above. If they’re not, they might just be backstabbing you and if you are not playing a brawler that is good with teaming you may actually not want a team with them because they might attack you thinking that they’re worried about you backstabbing them. Now the reason why this is the best time to team is because if you do not team with them they’re likely gonna keep spinning until they find somebody else to team with and then they’ll just come after you and take you out. The best way to counter a teamer is not to just ignore them and let them go on their merry way even if you don’t team with them. 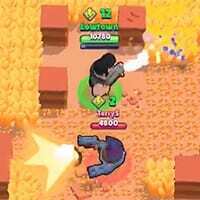 It is to fall one of the last two of the best strategies to use in showdown and one of those strategies is to be a backstabber. Backstabbers will team with anyone that will team with them and they may even pretend to be a true team for themselves but at the first opportunity that they find, backstabbers will take the person that they teamed with out and take their power-ups. They may wait until they have their super charged up so that they can quickly take them out with it. 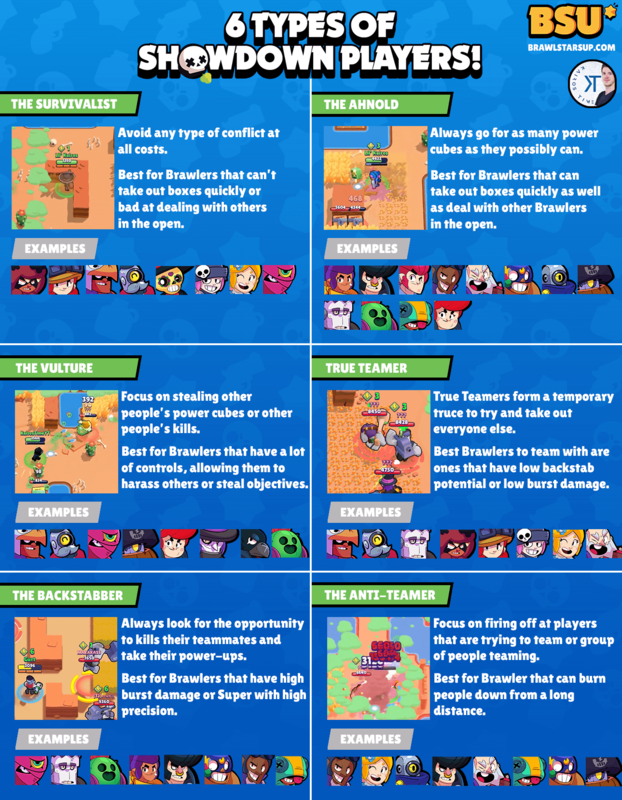 The best brawlers to backstab with our brawlers that have really high burst damage or a Super that can be really difficult to escape from. This includes Shelley, Bull, Brock, El Primo, Frank, Mortis, Tara, Spike and Leon. Whether you decide to team in the first place or backstab comes down to your own personal playstyle and how you want to play the game. But the best time to backstab is when you know that you can outbursts the other players health before their reflexes are able to kick in so that they can actually start attacking back at you to prevent being backstabbed. Pay attention to your enemy’s attacks and movements. If they let you deal the majority damage to the enemy player they’re probably conserving their own shot so they can take you out once they have the right opportunity. If they’re trying to get really close up to you, they’re probably trying to get close enough that they can quickly all the way in their attacks and take you out before you can react. However just because somebody that is teaming with you is attacking you does not necessarily mean that they are trying to backstab you if they’re attacking you a little bit and spinning. They probably are just trying to charge up their super on you so that you guys can then go and obliterate somebody else. One other tip is to avoid people that you teamed with even if you fall to low HP because hardly anyone is a true teamer, they’re mostly just backstabbers way to take you out so you got to watch your back because remember solo Showdown is in fact a solo game mode. The rule is do whatever it takes to be the last one standing. Anti-teamers are players who focus on firing off at players that are trying to team or on groups of players that are teaming. The strategy behind this is because you know that teamers will often find other teamers if you do not take them out early on. There is no way you will win. This is why you should not just ignore somebody that is spinning, you should either join them, you should either backstab them or you should fire off at them. Another reason why you might become an anti-teamer is because you don’t like how teaming grew in the game for you and so you’re trying to force people to play with their own skill rather than by teaming. Anti-teamers will focus their fire on someone else as soon as they see them spinning or they may even spin back so they can backstab them instantly, reminding them that solo showdown is in fact a solo game-mode. The best anti-teamer brawlers are brawlers that can burn people down from a long distance without getting hit themselves or a brawler that has a super that can allow them to get up really close to take one of them out and then get away or maybe even take the whole team out in one go. 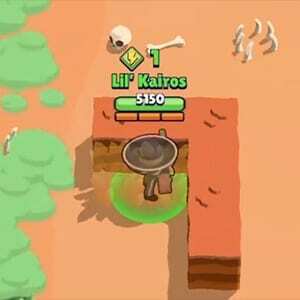 These brawlers include Colt, Bull, Brock, Dynamike, El Primo, Ricochet, Darryl, Piper and Leon. The best time to be an anti-teamer is well… it’s always the right time to be an anti-teamer but the best time is when you are confident that you know you can at least take one of the enemies out without dying. If you’re not confident, you can do that trying to stay away from them and wait until they actually engage with another player or another team so that you can attack from a different side and hopefully take the team out. v2.0 updated on Jan 27th 2019.